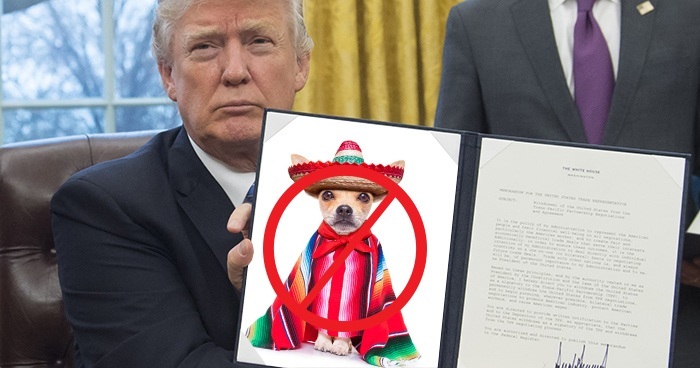 President Trump rolled out the latest revision of the aggressive immigration executive order this past Monday evening, suspending the beloved holiday “Cinco de Mayo” indefinitely. At the first ever rally held directly on the United States-Mexico border, Trump praised his own “beautiful” executive order following a performance by Ted Nugent. Unable to speak over the roar of the booming crowd, Trump whipped out a megaphone and noted, “Cindo de Mayo stole your jobs! They stole your Ford cars and ya know what they did? They drove ‘em over the border! It’s chaos worldwide!” Not only will Trump change the holiday’s namesake, he has vowed that Mexico will pay for the change. Trump followed up the statement by blasting an ominous tweet at 4:00 AM, inquiring as to whether or not the 4th of July was actually unpatriotic.